Tickets on sale now! Calling all sweethearts and sweet tooths - join us in Dundee's hottest new event space, the Hideaway, for a Valentine's experience not to be missed! In this hands-on class, you will learn how to whip up an impressive array of truffles using everyday flavors from your own kitchen and professional techniques taught by Chef Danielle. 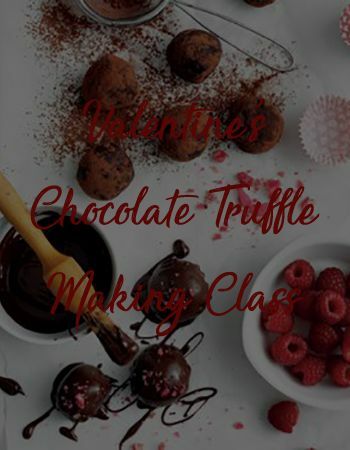 Ticket price includes 3 hours of hands on, interactive instruction and a selection of four handmade chocolate truffles for you to enjoy or give as a Valentine's Day treat. Our diverse selection of Dobbes wine, craft beer, and non-alcoholic beverages will be available for purchase at the event. Purchase 2 or more tickets, receive a $10 discount per ticket! $85/single ticket price, $75/2 or more tickets price. Club members, receive $10 off single ticket price and $20 off 2 or more tickets! $75/single ticket price, $65/2 or more tickets price. Log in with the email address associated with your membership and enter code CHOCOLATECLUB1 to receive your member pricing on one ticket, and CHOCOLATECLUB2 to receive your member pricing on 2 or more tickets. Tickets are fully refundable within 48 hours of the event start. No refunds less than 48 hours of the event start.